The tail of a dragon? For two weeks, national attention riveted on the Hayman Fire outside of Denver as it gobbled up 137,000 acres and 115 houses. 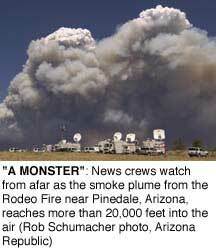 Then on June 23, the five-day-old, 200,000-acre Rodeo Fire in Arizona merged with the 94,000-acre Chediski blaze and bore down on half a dozen towns. That created what spokesman Jim Paxon called "a monster" that immediately took the Hayman Fire's place as the nation's number one priority. It also raised scary questions about what the rest of the summer will look like. "We've basically burned double the acres with a lot fewer starts than last year at this time," says Don Smurthwaite, a spokesman for the National Interagency Fire Center (NIFC) in Boise. "It's highly unusual that we've already experienced four fires in excess of 100,000 acres (in the lower 48 states) by the 24th of June." NIFC fire analyst Tom Wordell says that based on historical data, "We're going to see a greater number of large fires in the Southwest and Rocky Mountains this year, probably somewhere on the order of two to three times the average." Large fires aren't just big. They can - under the right conditions - exhibit much more extreme fire behavior than smaller blazes. Depending on the strength of the prevailing winds, says Wordell, "the power of the fire can overcome the power of the wind" - in effect creating its own weather and driving itself. Big blazes can generate 30,000-foot-high columns of superheated smoke that then collapse on themselves, igniting spot fires in all directions. But no matter what the size of this summer's fires, it's already clear that this will be a record-setting year in terms of damage to homes and businesses. "As of (June 26), we have 1,622 structures burned (nationwide)," says Smurthwaite, "In 2000, which was a very difficult fire year, the total for the (entire) season was 862." And while the fires burning now have come from a wide and bizarre variety of human causes - arson, an incinerated letter, a lost hiker's signal fire, a dumped pile of sod that spontaneously combusted - a much more serious threat is looming just around the corner. "There's a transition where we go from more human-caused (fires) to more lightning-caused fires," says Smurthwaite. "In the West, it does that flip-flop about mid-July. We're very worried that when the lightning storms start, we're going to see a huge increase in the number of fires."